London Blue Topaz Earrings. Rose Gold Filled Ear Wires. Genuine Gemstone. December Birthstone. Lightweight Earrings. These are some of the prettiest gemstones I've come across. These lovely little earrings are London blue topaz gemstones dangling from rose gold filled ear wires. The topaz is a gorgeous deep blue and a faceted drop shape. The stones measure about 9x9mm. The earrings measure about 1 inch (2.5cm) in length from top to bottom. 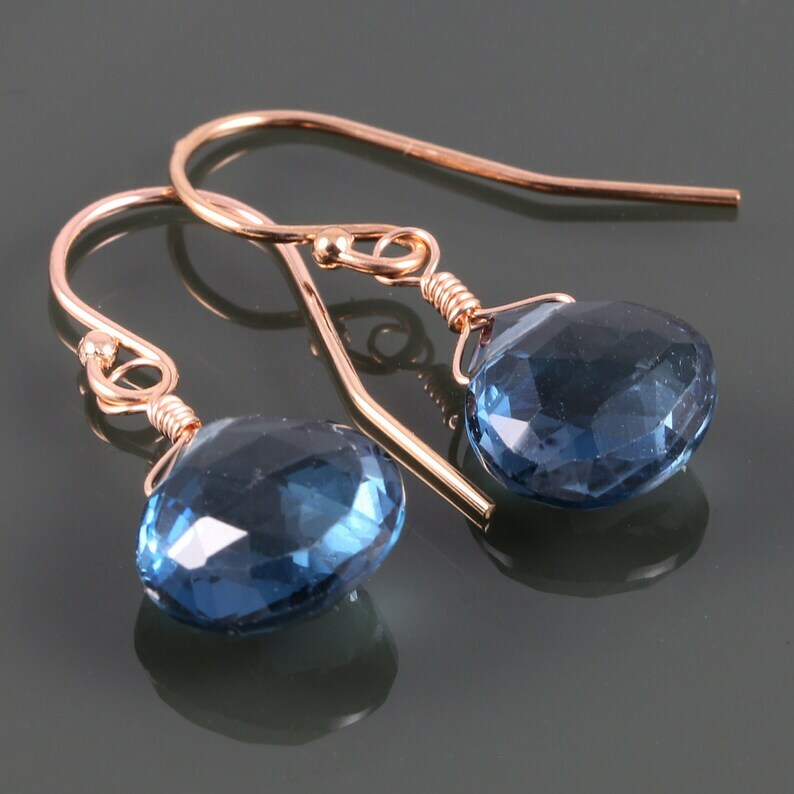 Blue topaz is December's birthstone, making these earrings a lovely December birthday gift. Gold-filled metal is made by heat and pressure bonding a solid layer of gold over another metal (such as brass). This is different from gold-plated metal, which is made by electroplating a very, very thin layer of gold over another metal. 14/20 gold-filled metal has a layer of 14 karat gold that makes up 1/20 of the volume of the metal (or 5%). I like gold-filled because it is an affordable alternative to karat gold, while still being durable and dependable. It is a quality metal for jewelry. I'm happy to include a card with a message for your gift recipient. Just let me know what you would like the card to say. London Blue Topaz Earrings. Gold Filled Ear Wires. Genuine Gemstone. December Birthstone. Lightweight Earrings. London Blue Topaz Earrings. Titanium Ear Wires. Genuine Gemstone. December Birthstone. Lightweight Earrings. Swiss Blue Topaz Earrings. Gold Filled Ear Wires. Genuine Gemstone. December Birthstone. Swiss Blue Topaz Earrings. Sterling Silver. Lever Back Ear Wires. Genuine Gemstone. December Birthstone. Lightweight Earrings. Spring Cleaning Sale! All in-stock earrings are now 20% off! These little baubles are both lovely and well-made. I'm building a suite of blue tiger eye jewelry and these delightful earrings are the start. Thank you! Dark Blue Tiger Eye Earrings. Rose Gold Filled Ear Wires. Genuine Gemstone. Small Drop Earrings. Nice earrings. Exactly as described. I love these simple, understated elegant citrine lever back earrings! Beautifully done earrings with nice smokey quartz stones. I love taking custom orders! Please contact me if you are interested in having a piece custom-created. See below for more info. I like a piece of jewelry in your shop, but I'd like it with a different stone or metal. Can you make it for me? If you see a design in my shop that you would like made with a different gemstone or in a different metal, please let me know, and I'll send you a price quote and time estimate for the work. I require full payment before making your piece. Custom orders are not eligible for a refund or exchange. If there is a problem with your custom jewelry when you receive it, please contact me right away so we can find a solution. Do you offer custom design services? Absolutely! For bespoke custom-designed jewelry, I require a $100 non-refundable deposit that will go toward your purchase. I charge an hourly rate for time spent designing your one-of-a-kind jewelry. I will send you a detailed rendering for your approval. Once we have agreed upon your design, I will send you a price quote and a time estimate for the work (typical turnaround time is 2-3 weeks). I require full payment up front before I order supplies or start making your piece. If you choose to cancel before I have completed your jewelry, 50% of the price of the jewelry is non-refundable. Design fees are 100% non-refundable. I will send a photo for your approval before shipping. Can I reserve a piece of jewelry in your shop? Wholesale inquiries are welcome. Please contact me with information about your retail business, and I can send you my line sheets. Let's make sure your handmade Lava Jewelry ring is going to fit correctly! Since I'm selling online, I am unable to measure your fingers for ring sizing myself. Therefore, it is your responsibility to provide me with an accurate measurement. There are sizing guide pdf's available online, but what I strongly recommend is going to your local jeweler for a measurement. If you provide with me with the inner diameter measurement in millimeters, that will be the absolute best. I can work to a precision of 0.1mm. Because resizing a ring is just about as much work as making an entire new ring, it's not a service I'm able to offer for free. Resizing fees start at $20 for a simple sterling band, and go up from there. Please contact me for a quote. Remove rings and bracelets before doing housework or gardening. Clean jewelry gently with warm water and mild soap, or take to a jeweler for professional cleaning. Do not attempt to clean damaged jewelry. Take it to a professional jeweler for cleaning and repair. Store jewelry in a dry location to prevent tarnish. Store each piece of jewelry in its own compartment to avoid tangles. Avoid exposure to chemicals such as perfume, chlorine, and household cleaners. All Lava Jewelry orders come gift wrapped and ready for giving. Please contact me if you would like me to enclose a note card for your gift recipient. Do you offer hypoallergenic earrings? Nickel is the most common metal allergy that people have. None of my earrings contain nickel. Some people do have sensitivities to other metals such as silver or copper. If this is the case for you, I recommend selecting titanium ear wires. They are less likely to cause a problem for people with metal sensitivities. I can also make a custom pair of earrings with niobium wire instead of sterling silver or gold filled. Just contact me for further information. I accept returns if you contact me within 3 days of receiving the item, and return the item in its original condition within 7 days. Returns are subject to a restocking fee of 25% of the price of the item. Earrings are subject to an additional $5-8 ear wire change fee. Clearance items and custom orders cannot be returned. London Blue Topaz Earrings. Sterling Silver Ear Wires. December Birthstone. Bali Style Earrings.